To reflect our broader and more international mission and to boost our visibility among very different audiences, we are pleased to announce that we are adopting a new logo, which is strong and impactful yet easily recognized and understood in all cultural contexts. There is continuity with the previous logo in terms of the colour and the two languages used. The new “seal” design symbolises the commitment taken by armed groups to respect international humanitarian law in conflict situations, while the “wave” recalls the need for a humanitarian dialogue with armed groups on the respect of the civilian populations. Negotiated the signature by 8 brigades of the Free Syrian Army of the Deed of Commitment prohibiting sexual violence and the signature by 7 brigades of the Deed of Commitment prohibiting the use of child soldiers. 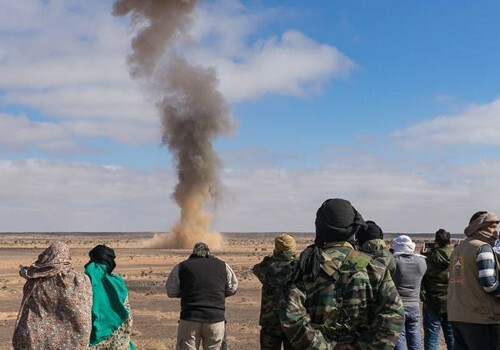 On 22 May 2018, Geneva Call monitored the destruction of 2,500 stockpiled anti-personnel (AP) mines by the Sahrawi Mine Action Coordination Office (SMACO) in accordance with Geneva Call’s Deed of Commitment banning AP mines, signed by the Polisario Front in 2005.The event took place near Tifariti in the presence of representatives of the Polisario Front and of the international community. 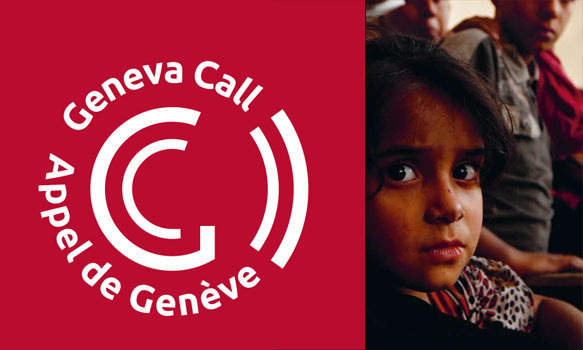 Geneva Call welcomes the new measures taken by People’s Protection Units/Women’s Protection Units/Democratic Self-Administration in Rojava (YPG/YPJ/DSA) to address the violations of the Deed of Commitment protecting children in armed conflict signed with Geneva Call in 2014. The world is currently witnessing the highest levels of displacement ever recorded globally; 20 people are forcibly displaced every minute as a result of conflict or persecution and the number of new displacements associated with conflict and violence has almost doubled, from 6.9 million in 2016 to 11.8 million in 2017. In light of the growing humanitarian consequences of displacement, Geneva Call has decided to strengthen its humanitarian engagement with armed non-State actors (ANSAs) on this thematic area. In particular, Geneva Call plans to focus on increasing their knowledge of the applicable legal obligations with regard to the protection of displaced persons and the prohibition of forced displacement.